Brain endothelial microRNAs are deregulated in inflammation in vitro. 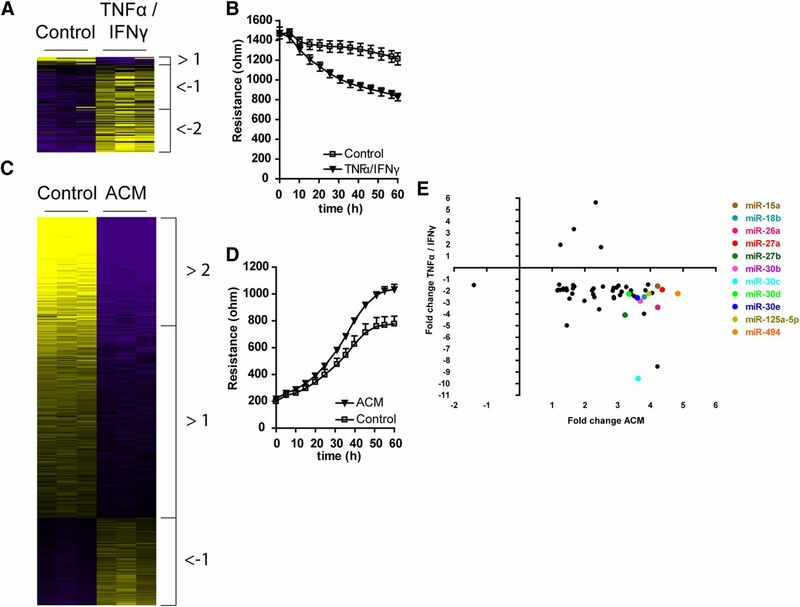 A, C, Heat map of differential microRNA expression in (A) TNFα and IFNγ (10 ng/ml for 24 h) and (C) astrocyte factor-treated (ACM, 50% v/v, 48 h) hCMEC/D3 cells. Purple indicates relatively higher expressed microRNAs. Yellow indicates relatively lower expressed microRNAs. B, ECIS analysis of control and TNFα/IFNγ-treated hCMEC/D3 cells. Maximal resistance in control: 1014 ± 41.2 Ω; TNFα/IFNγ: 667.6 ± 41.2 Ω, n = 4, p = 0.001 by Student's t test. D, ECIS analysis of control and astrocyte-derived factor-treated hCMEC/D3 cells. Maximal resistance in control: 1673 ± 1.1 Ω; ACM (50% v/v): 2008 ± 58.8 Ω, n = 3, p = 0.001 by Student's t test. Error bars represent the mean ± SEM. E, Representation of common microRNAs regulated after ACM and TNFα/IFNγ-treatment in hCMEC/D3 cells. Brain endothelial microRNAs are deregulated in MS patients. A, MS and non-neurological control patient characteristics. B, Capillaries isolated from normal-appearing white matter were characterized for expression of brain endothelial cell markers zona occludens-1, claudin-5, VE-cadherin, and P-glycoprotein; the pericytes marker platelet-derived growth factor receptor-β; and astrocyte marker GFAP at the mRNA level by qPCR analysis. Data show the relative abundance of the indicated mRNA normalized to GAPDH ± SEM. C, qPCR analysis of microRNAs in brain capillaries isolated from brains of non-neurological controls (blue), MS patient normal-appearing white matter (NAWM, green), and MS lesions (red). Data show the mean fold expression relative to control tissue ± SEM, n = 4, *p < 0.05, **p < 0.005 by Student's t test. D, qPCR analysis of miR-125a-5p in brain endothelial cells isolated by laser capture microdissection from NAWM and MS lesions in six individuals. 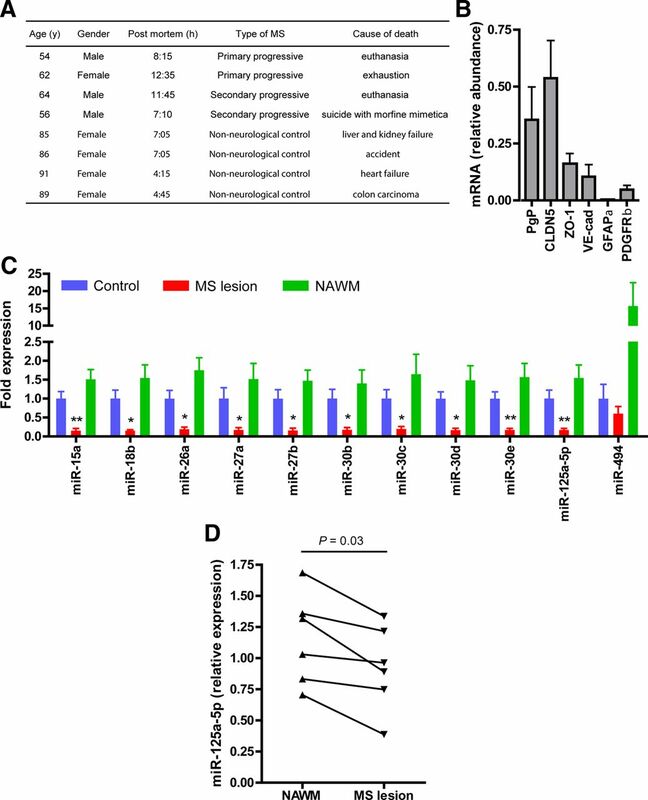 Data show the relative abundance of miR-125a-5p normalized to the small nuclear RNA U6. p = 0.03 by paired Student's t test. 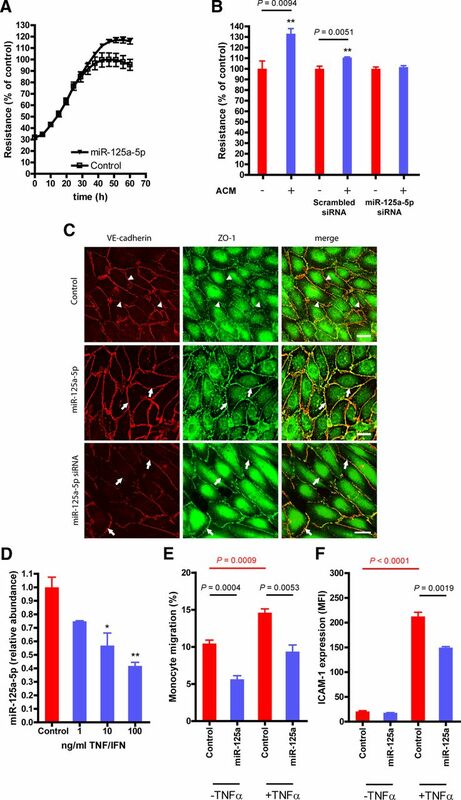 Brain endothelial miR-125a-5p regulates barrier tightness and prevents leukocyte passage. A, B, Overexpression (A) and knockdown (B) of miR-125a-5p in hCMEC/D3 cells significantly modulates barrier tightness in control (A) and ACM-treated cells (B) as determined by ECIS (control: 809.3 ± 48.9 Ω; miR-125a-5p: 948.5 ± 18.7 Ω). C, VE-cadherin and zona occludens-1(ZO-1) subcellular distribution in control cells, in miR-125a-5p-overexpressing hCMEC/D3 cells, and in miR-125a-5p-knockdown hCMEC/D3 cells. Scale bars, 25 μm. D, TNFα treatment of hCMEC/D3 decreases the expression of miR-125a-5p as measured by qPCR. Data show the abundance of miR-125a-5p normalized to the small nuclear RNA U6 relative to levels in control cells ± SEM, n = 3, *p < 0.05, **p < 0.005 by Student's t test. E, Transendothelial migration of monocytes was studied in control hCMEC/D3 cells and in cells with enhanced expression miR-125a-5p previously treated or not with TNFα. Data are expressed as the percentage of transmigrated monocytes and show the mean ± SEM. F, ICAM-1 expression in control hCMEC/D3 cells and in cells with enhanced expression of miR-125a-5p in the presence or absence of TNFα as measured by flow cytometry. Data are expressed as the mean fluorescence intensity and show the mean ± SEM.